I was recently sent two products from Queen Helene's Volcanic Ash line - The Voclanic Ash Masque and The Volcanic Ash Scrub. These are perfect for that deep clean and smell wonderful. (Smell is important for anything that goes on your face!) I've really enjoyed adding these to my skin care routine. NEW! VOLCANIC ASH MASQUE: This skin-detoxifying facial masque harnesses the purifying power of Volcanic Ash (also known as Bentonite) to deeply clean skin. Known for its ability to draw out pollutants, Volcanic Ash acts like a magnet for pollutants, bringing them to the surface so they can be washed away. The result is refreshed, renewed skin. NEW! VOLCANIC ASH SCRUB: This skin-purifying facial scrub harnesses the power of Volcanic Ash to deeply clean skin. Enriched with natural, healthy ingredients to provide targeted skin benefit. MINT JULEP MASQUE: This deep cleaning facial scrub deeply cleans and helps unclog pores and draw out impurities, while hydrating Glycerin helps maintain skin moisture balance. After use, skin is clean with a fresher-looking complexion. For Oily, Acne-Prone Skin. Deep cleans and refreshes. 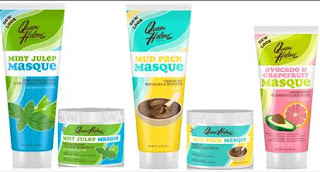 MUD PACK MASQUE: This classic facial masque is enriched with Kaolin, a natural English Clay known to immediately lift away impurities and revitalize tired looking skin. After use, skin feels firmer while fine lines and wrinkles appear diminished. For Aging Skin. Revitalizes and detoxifies. AVOCADO & GRAPEFRUIT MASQUE: This unique, gel-clay masque gently lifts away impurities and nurtures skin with smoothing Avocado and antioxidant Grapefruit extract. After use, skin is refreshed and energized with a healthy radiance. For Normal to Dry Skin. Rejuvenates and revitalizes. NEW! SHEA BUTTER CRÈME: This nourishing crème features rich Shea Butter to deeply hydrate skin. Packed with fatty acids, Shea Butter has been used for centuries as the ultimate moisturizer. Its inherent calming properties work especially well on sensitive or irritated skin. The result is smooth, supple skin. 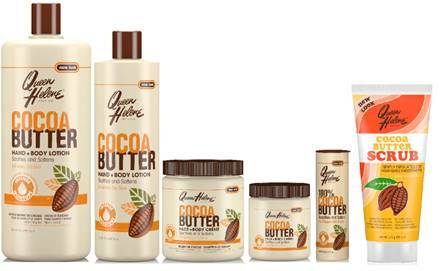 COCOA BUTTER HAND & BODY LOTION: This luxuriously rich, non-greasy lotion blends cocoa butter and pure lanolin to quench and relieve moisture-starved skin. Protects against the drying effects of sun and wind; helps diminish the appearance of wrinkles; and soothes the discomforts associated with stretched skin during and after pregnancy. Soothes and softens extremely dry skin. 100% COCOA BUTTER STICK: This pure cocoa butter soothes and nourishes dry, chapped skin. Delivers on-the-spot nourishment for dry, irritated patches. Helps relieve the discomforts of stretched skin during and after pregnancy. Also works well to soothe and moisturize dry, chapped lips. COCOA BUTTER SCRUB: This soothing facial scrub helps draw out impurities and remove dead, dry skin cells, while natural Cocoa Butter helps replenish lost moisture. After use, skin is soft and smooth with a supple appearance. For Extremely Dry Skin. Gentling exfoliates for nourished smoothness. Visit Queen Helene to learn more and to use their store locator to find products near you!